Did you know that there are thousands of people across the country searching for hypnotherapists right now? Attract clients that are already actively searching for YOU! Because chances are you’ve slowly seen the diminishing influence of conventional advertising and marketing strategies in the last 2 years and you are being forced to go online. Damn! That means you need to get internet savvy! Know the feeling? Does any of the following sound like you? Don’t know how to use Social Media effectively? Website not ranking anywhere on Google? Are you being prospected by internet marketing companies and don’t know what they’re talking about? Are you anxious about committing to internet marketing companies because of negative rumours of their ineffectiveness? Are you just lost in keywords, SEO and internet jargon? How to attract and connect with your target clientele on the internet – even if you don’t have a website! Like most hypnotherapists and indeed anyone with their own business you have probably spent time and money on the problem of generating leads and clients in the past with limited success. Maybe your message was wrong, your advert was in the wrong advertising medium, or your proposition was not attractive enough. Why should going online be any different? But I’ve got a website and it doesn’t bring in many enquiries! Well, surprise surprise, it’s not enough any more to just have a website. The internet is busy. It’s competitive. And the market is becoming clever at searching for what it wants. You need to be one step ahead of the game just to maximise the potential that is your website. That means getting your website ranked on google at the very least as near to the first page for your relevant keyword search as possible. But being a bit of an internet novice, you’re struggling to make your website work for you without spending a small fortune on things you don’t understand. Sound like you? It was me a few years ago! I painstakingly went through the learning curve to set myself up with the basic principles of the online environment, listening to various teleseminar ‘gurus’ in the world of online marketing and studying hard how to find my way round the internet pushing my site up the rankings. That is until I met Robert Keating. But first let me continue the story. Do you know how to use it? I remember coming across twitter around 2 years ago. It was being hailed as something big…. but I couldn’t even work out what it was all about! It was double dutch to me. If you’ve come across this page through social media, you’re already ahead of 95% of other therapists! But so many people just aren’t using it, a) effectively b) at all! This presents a huge opportunity for YOU to get a massive head-start on your competitors and take advantage of the amazing features of the internet. Get with it or get left behind!Harsh but true! Because there is NO turning back. The online environment is with us to stay. Even in the world of therapy, there is no longer any excuse for not knowing how you are positioned online. 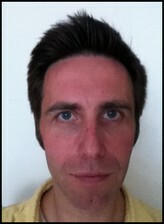 Robert Keating is my right hand online marketing guru. Rob has been working in the online environment for a few years now and is in the trenches everyday building and ranking websites everyday for himself and his clients. What a relief to have found someone who can advise and implement some strategies for me so that I don’t have to spend all my time working it out for myself. Rob was my teleseminar guest and he presented an easy to understand jargon-free guide to getting your website ranked higher on google. 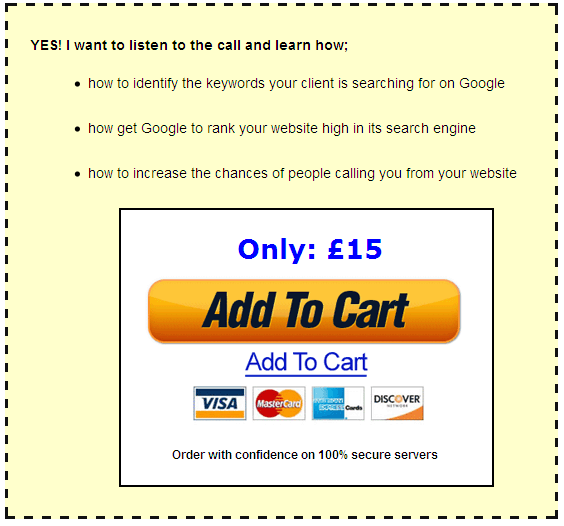 So for minimal cost, no lengthy day long seminars, and no need to leave your own home, needing only a window of your time, listen to the call and use it as a guide to how to get your website ranked higher on the main search engines. All you pay is £15 and the call is yours to listen to again and again. And we offer a guarantee that if you learn absolutely nothing, you can have your money back. Stack £15 against one of your client hours. It may amount to only around a quarter of one client hour. Think it’s worth it? If you manage to draw in 1 extra client because of this hour it will have paid for itself 4- fold. However, do what Rob tells you and you will start to convert, over a few weeks, more and more visitors to paying clients. 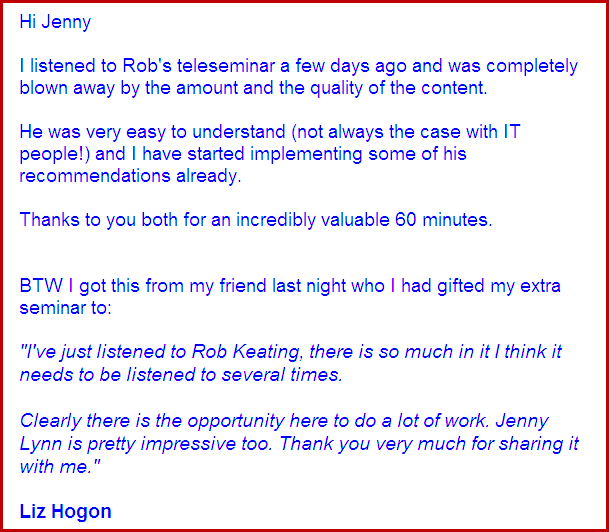 AND if that wasn’t enough, Rob is being so generous that when you invest in the call for just £15, he will send you over completely valuable bonuses: a PDF report and a video which will flesh out and walk you through the steps he will be covering. AVAILABLE FOR DOWNLOAD AFTER THE CALL! So that as many hypnotherapists, counsellors and psychotherapists can gain from this intense, information packed, practice boosting teleseminar we have agreed to not only host a live call that you can dial in to and get the information hot off the press, but you can also subscribe and be guaranteed that you will be able to download the recorded audio and bonus material to listen to it in your own time whenever suits you. We want you to really value this information and get a lot from it. So for just £15, the price of a paperback book or a round of drinks, you will receive some absolutely vital pointers to getting a presence on Google and growing your practice, creating a profitable business out of your years of experience, insight and training. Don’t you deserve it? We guarantee that if you decide at the end of the call it didn’t help you at all and you learned nothing new, that you can have your money back. Once you have completed your registration and payment you will be emailed your access details immediately.